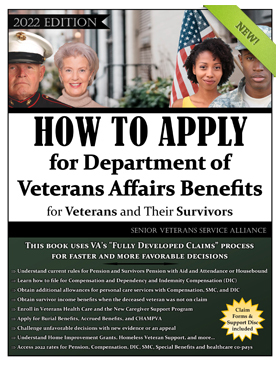 The Senior Veterans Service Alliance is proud to announce publication of our 2019 "How to Apply" book edition. It is a welcome and needed resource for veterans of any age, their families, survivors, and for the professionals who assist them. This new 2019 edition is the most important revision made since our first printing in 2014. All previous year's additions are now out of date. This new book provides current information on VA Rules and detailed instructions on how to submit "Fully Developed Claims" to VA's Intake Centers. 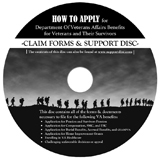 Disc - Intake Center Mailing/Faxing Information, 200 + Current VA forms, 2019 Benefit Rates, Detailed Checklists (instructions for each type of claim), Medical Examination Worksheets, Medical Questionnaires, and an Addendum on VA's Proposed Rule Changes for Pension. 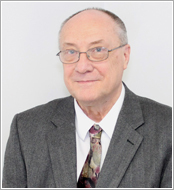 "There are scores of books available on veterans benefits. We have perused a number of them through purchase and many others through published tables of content and published excerpts and we believe that none of them contain the level of instructions on the complicated claim processes that we provide in this publication. Many of these other books describe how to qualify for the benefits and what the benefits are and then obliquely reference a few forms that can be obtained online. Others do go into more detail on what encompasses a successful claim but they do not provide step-by-step instructions. It is our opinion that none of these books would adequately assist you in filing a successful claim. We believe our book is totally unique in providing you the nuts and bolts, step-by-step instructions and strategies to file successful claims for the four disability income benefits offered by the Department of Veterans Affairs." Are you looking for a CLE Course to maintain your Accreditation with the Department of Veterans Affairs? For agents and attorneys already accredited with VA, we offer two approved 3 hour video courses to meet your initial first year CLE requirements or any additional three hours on veterans benefits law and procedures required every two years.